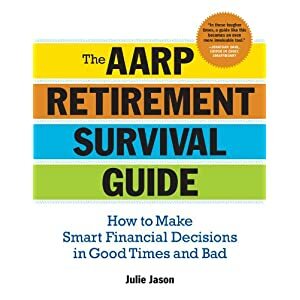 My review is on “The AARP Retirement Survival Guide – How to Make Smart Financial Decisions in Good Times and Bad.” The author, Julie Jason is a personal money manager who started her career as a securities lawyer 30 years ago. Her goal in writing this book was to create an educational consumer-protection guide for soon-retiring baby boomers. AARP (American Association of Retired People) got involved because their mission is to publish books that enrich the lives of older Americans. This book provides a good overview of financial planning options for retirement such as how much you should save, how much you can afford to take out every month. The book won the Best Finance Book at the International Book Awards and was chosen the top business book by Booklist. The first thing you notice when you open the book is the large print making the book easy to read. It is very detailed oriented and provides lots of tips and lists of things you need to have handy when working on your retirement. For example, there is a list of exactly what you need to bring with you to the social security office when you are first applying for benefits. The book offers clear directions on things such as “Where do I begin?” and what to do when your spouse has very different ideas about retirement. The book offers very helpful self-assessments, checklists, and tools that are designed to help even the absolute beginner under stand some very complex topics. There is a detailed rating system for varying products as well as some really helpful “Don’t be Fooled Rules”. Ms. Jason provides her expert opinions on various topics. She rates things like how motivated is a product salesman to does your decision let you sleep at night. She has several “Don’t be Fooled” rules that help educate retiring consumers and protects them from unscrupulous or overzealous salespeople. Along this line, she has one entire chapter dedicated to these topics called “ Perfect Storm of Disaster for Retirees – Sales Tactics, Scams and Bad Advice”. There is also a great deal of information on evaluating retirement income products. I found this information to be helpful and educational but came away with a sense that a financial advisor would be the smartest way to go since so much can go wrong if you don’t know what you are doing. As for not yet ready to retirement younger readers, there are lots of recommendations that can help put them on a better, more prepared path toward retirement. The book finishes with a step-by-step retirement readiness test. Overall, the book was a helpful and educational tool. I would recommend this book as a first step toward putting together a comprehensive retirement plan. It highly suggests the use of a financial advisor. However, it does not go into detail on specifics of individual plans. This book would be a very good reference book that would allow to reader to return as needed for comprehensive explanations for different types of financial products or salespeople.